I think the currently layout is the best choice considering the chaise on the sectional. I think a round dining room table with help improve the flow of the space. I suggested a gold rug that is very craftsman in style but will also tie in the gold accents in your throw pillows and drapes. In the dining area I think you should go with the Benchwright table if you can! It's gorgeous and expandable. The West Elm table isn't, so it might not give you as open of a feeling. The arts & crafts style table is the same finish as your current chairs, so if you decide you like that one, your chairs now would work best. 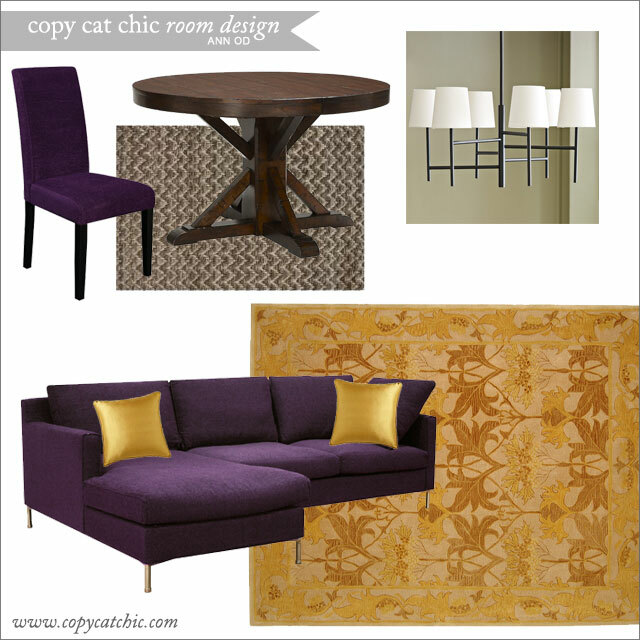 Although I thought the purple chairs were fun and of course compliment your sofa. I suggested a simple rug in the dining area just so it won't compete with the living area rug. Although, if you'd prefer not to have a rug in there, that would work perfectly fine. benchwright round table $1,399 *This table puts you over budget by $25, but it's so worth it!